It is not always easy to find accommodation for a short period in town. 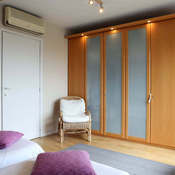 An apartment for rent in Laeken will provide you with an easy and pleasant solution. Two studios located in my house welcome you, furnished and fully equipped. An ideal place to stay for those seeking for peaceful in the heart of the city. One of the bedrooms has a small lounge on the mezzanine and the other, a terrace with a view of all Brussels. It is easy to park in the neighbourhood with plenty of free parking. A laundry room is also nearby. Each apartment is very close to the city thanks to the good connections by public transport. This ideal situation mixes easy access to the centre while remaining serene. The north of the city remains indeed very calm and airy, with some fields in the vicinity. You will enjoy the peaceful character of the countryside without being isolated. Enjoy also a pleasant setting. 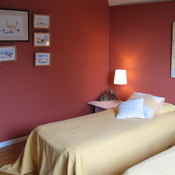 Interior Architect and "plural artist", I arranged and decorated the whole of La Reverdie with care. The style mixes purified lines with those of some memories that I bring back from travel. The whole is studied in order to bring you a practical and comfortable place of life. Would you like to rent a studio? Do not hesitate to contact me via the online form. La Reverdie is located in Laeken in the north of Brussels. I remain at your disposal for any question or additional request!